A treasure trove for fans of that Tex-Mex sound. Here are all of Weldon Rogers' recordings from 1955 (Queen and his own Je-Wel Records) up to the late 1960s for K-Ark records. The music ranges from pure rockabilly to hillbilly and country. All four Imperial masters are included (So Long, Good Luck, Goodbye; Trying To Get To You; Sale Of A Broken Heart; My Only Love), and the last three are reissued here for the first time. Trying To Get To You, initially was planned for issue but then by mistake Roy Orbison's version went on the back of the Weldon Rogers single. "I was always scared. I was in Big Spring when Lefty left there...Lefty said, ‘Come go with me. You can make it, too.' I said, ‘No, man, I got a full time job.' He said, ‘Man, I'm gonna make it in music. If I'm not gonna make it in music, I'm not gonna make it.' And I said, ‘Well, the only difference between you and I is, I'm gonna make it and I know I'm gonna make it. I gotta have food on the table.' I often remember what he said to me at that time, but I could never bring myself to just turn loose and just go out. I never felt I was that good, frankly." It's easy to forget today, especially when even many learned country music histories are written from a Nashville-centered perspective that make it seem as if that city has always been the center, the heart of country music activity, that it really wasn't very long ago when the music scene was far more regional, far more locally oriented. Stars that cross regional boundaries have existed since the beginning -- witness Jimmie Rodgers -- but has really been in the last generation, perhaps a little longer, that regional scenes have been subsumed by a national one. Such scenes have never disappeared entirely, especially in places like Texas (where it seems these days to be resurgent) and California. Some still survive, and in a few cases thrive, though very few have a distinct local flavor that hasn't been entirely overshadowed by the sounds emanating from Nashville. Weldon Rogers is a prime example of a career caught in the transition from a regional to a wider emphasis. His recording career hit full steam at a time when regional artists were increasingly aping the sounds coming out of Nashville, with local character disappearing proportionately as Nashville's influence grew, and when getting airplay more and more often meant sounding like everything else coming out. Rogers' recordings both reflected the changing marketplace and defied it. They retained an individual and regional character while still responding to prevailing winds and sounding just enough like what was dominating the larger scene that they stood a chance of competing, of getting played beyond the artist's regional reach of personal appearances and local radio play. Weldon Rogers is more than just a prime example of a vanishing breed, however. He was a strong, unabashedly country singer and songwriter with a keen ear for making records that were both uncompromising and commercial. He and his then-wife Wanda, a.k.a. Wanda Faye and Wanda Wolfe, were also a perfect country duet, and their sides together, many collected here along with Weldon Rogers' solo discs (and those made with his brother Willie and one-time-only duet partner Vennie Nice), hold up amazingly well almost four decades later. Rogers may be, in the larger picture, just a footnote, but that's hardly a reflection of talent, but rather one of circumstance -- of time, place, luck and, ultimately, ambition. In fact, when all is said and done, Rogers main claim to fame is probably not his own recording career, but the fact that he was responsible, along with partner Chester Oliver, for Roy Orbison's first recordings, Ooby-Dooby/Trying To Get To You, released on Rogers' own Jewel record label way back in 1956. Regardless, Rogers made some excellent music himself, mostly hard-core honky-tonk even if his best known recordings are cherished for their rockabilly overtones -- his 1957 Imperial records classic So Long Good Luck And Goodbye, on which he used Orbison's recently dropped Teen Kings, and his heated 1959 Jewel release Everybody Wants You, a reworking of Everybody Wants To Be My Baby, a duet with Wanda that featured the smoking electric guitar of young Glen Campbell. Those recordings are collected here with 25 others from Rogers' first recordings for Queen in 1955 to some of his last for K-Ark from 1968 (recordings tellingly made in Nashville rather than back in Texas or New Mexico), including many of his classic duets with Wanda Rogers. 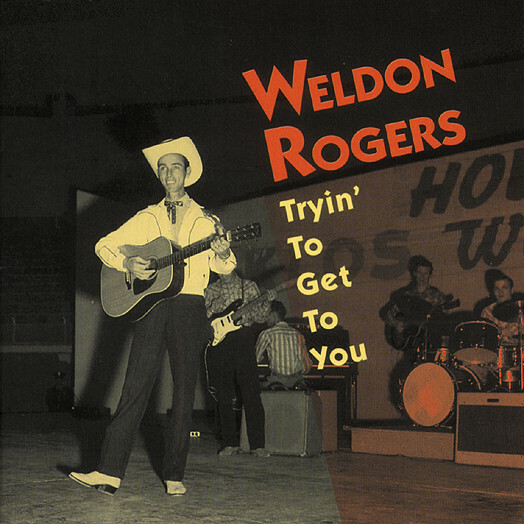 WELDON ROGERS, the part Irish -part Cherokee son of a dustbowl farmer, was born in Marietta, Oklahoma on October 30, 1927. His family moved to Lamesa, Texas when he was about eight. They grew cotton and maize and worshipped at the small Baptist church where Rogers, who sang loudest, was selected as psalm leader. Rogers has divided his long working life between jobs as a dee-jay, playing in a band at weekends and cutting records on the side. He first dee-jayed on KSML in Seminole, Texas in 1954 (his favourites included Ernest Tubb and Leon Payne) and cut his debut disc for Queen Records, a San Antonio label owned by Wink Lewis (though Hoyle Nix's records dominated the roster). In 1955, local oilman Chester Oliver financed Je-Wel Records named after Weldon and Oliver's daughter, Jeanne, who played accordion in Rogers' band. They occupied a slot on Midland's KMID-TV on Saturday afternoons just before the Teen Kings, another local band whose leader, Roy Orbison, attended Odessa Junior College. It was Chester Oliver's idea to record Orbison who cut his first record, Ooby Dooby and Trying To Get To You (Je-Wel 101), at Norman Petty's studio in Clovis, New Mexico. Other records on Weldon's own Jewel label featured Rogers and Wanda Wolfe - Everybody Wants You is a rare but rockin' duet - and Weldon and Wanda Rogers; Weldon married Wanda after she was divorced from Roswell-based singer, Bob Wolfe. According to Rogers, he was introduced to Lew Chudd during a visit to Los Angeles. "I was signed to a contract", he recalled. "I went down to Wink, Texas and got Roy Orbison's band, the one he had used on 'Ooby Dooby'. I also visited my sister who lived in Andrews, Texas. When I left I had three songs written and on the way to the session with Roy's band in the car with me I said 'Well if I don't get four songs to record to take back to Lew Chudd it's gonna be so long, good luck, goodbye! And James Morrow said 'Hey, that's a good song title.' I drove the rest of the way to Clovis with one hand and wrote the song with the other one. After all was said and done it was the best of the bunch!" Customer evaluation for "Trying To Get To You"